My snare has an odd sound.. 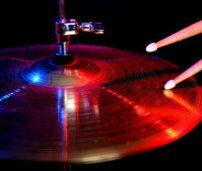 I have 2, the first 1, the wire rattles after I strike it, producing a buzzing noise, & the second 1 sounds like a combination of hitting the snare & the snare turned off simultaneously. Sorry about the poor noise descriptions..
**Adjust the snare tension. You may need to make the snares tighter or looser, but a little experimenting will probably get you closer to the sound that you want. In case you don't know, the tension adjustment is the little knob at the top of the snare throw-off lever. **Adjust the muffler. Again, you need to experiment to know whether it needs to be increased or decreased. The muffler knob is the other knob--usually on the side of the snare. **Tune your heads. The tension on the heads can have a lot to do with ringing or buzzing. Again, experimentation is the key. try a wider snare for a different sound.